I bought the LP partly because the title: Flop . The pictures of the singer and the band did not promise much, but since it was a behind-the-iron-curtain record and some sort of rock’n’roll, I gave it a try. The name of the singer is Karel Zich. I just did a Google search and found out that he is still alive and singing. He has a nice website with many videoclips. I have no idea what country he is from. The LP was released on Supraphon, so I guess he is from Poland. But his website is from Czecholowakia. Not that it matters much: I could not point these countries out on a map if you asked me. On the LP Karel Zich is doing mainly Elvis songs. On the picture on the back of the sleeve he even tries to look like Elvis. I am more fascinated by the four other musicians, especially by their very un-rock’n’roll moustaches. The music on this LP by Karel Zich is better that you might expect on basis of the cover. The LP was made in 1983, which in Poland and Czechoslowakia was something like the late sixties or early seventies for us, musically. Although Karel Zich is doing his best to imitate Elvis, he comes away with it. He is a good singer, the band is okay too, and the three original songs on the LP are not out of place. 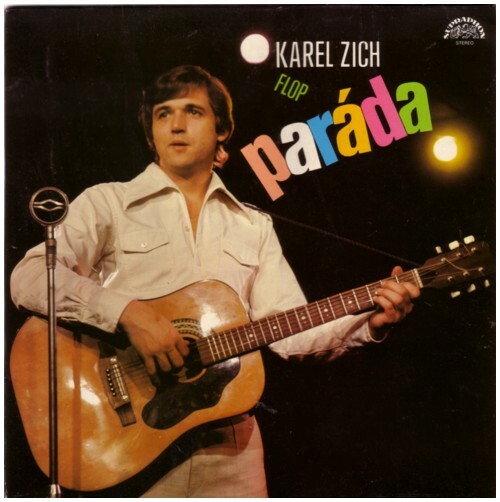 But the main attraction of this LP is that Karel Zich sings in his own language, whatever that is. Here is one of the not-Elvis songs, Rubikova kostka . And before I get mails from people who want to hear Karel Zich doing Elvis, here is Je to fajn, mamo. Ha ha, after having collected records for so many years you don’t know Supraphon is Czech! Muza operated in Poland of course. Also, saying in 1983 the Czech were 20 years behind of us, is a highly nonsensical popular statement. This sounds like your typical Dutch horrible fifties revival trash from the eighties, doesn’t it? For every good Dutch record there’s a good Czech record and probably 20 good Polish records. For every good Dutch film there are at least 50 good Czech films. And as for animation the equotion enters astronomical digits so I’ll leave it at that. Lou Kash is completely right in his comment. I should not have written this. It is not funny. I have taken the worst parts out and hope that I will not do this again.